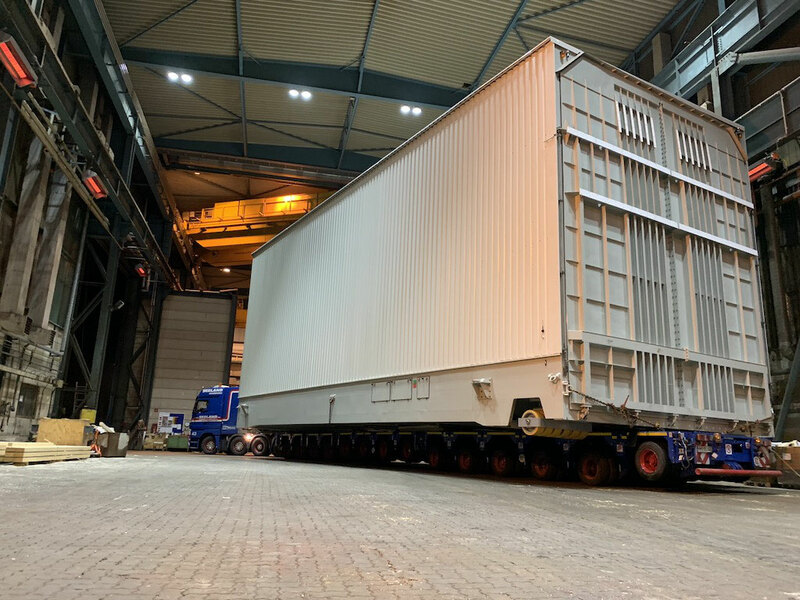 End of December one customer used our hall for assembling a transport container with final dimensions of length 20.50 x width 7.56 x height 8.90 m and a total weight of 80.00 tons. 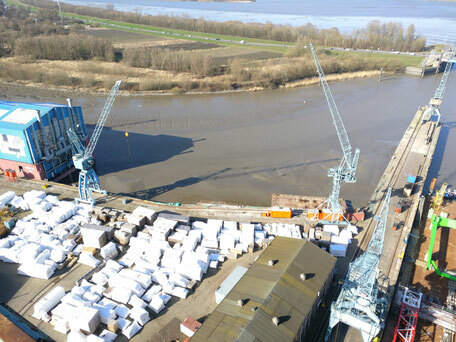 The whole assembly steps took place as from beginning of December. 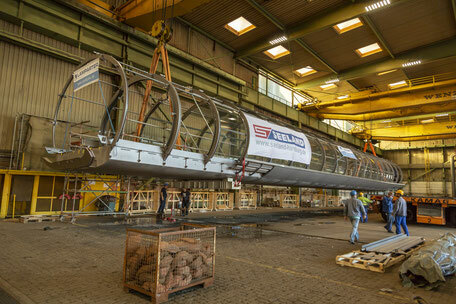 At this point it was the largest piece that has been assembled at our facilities. 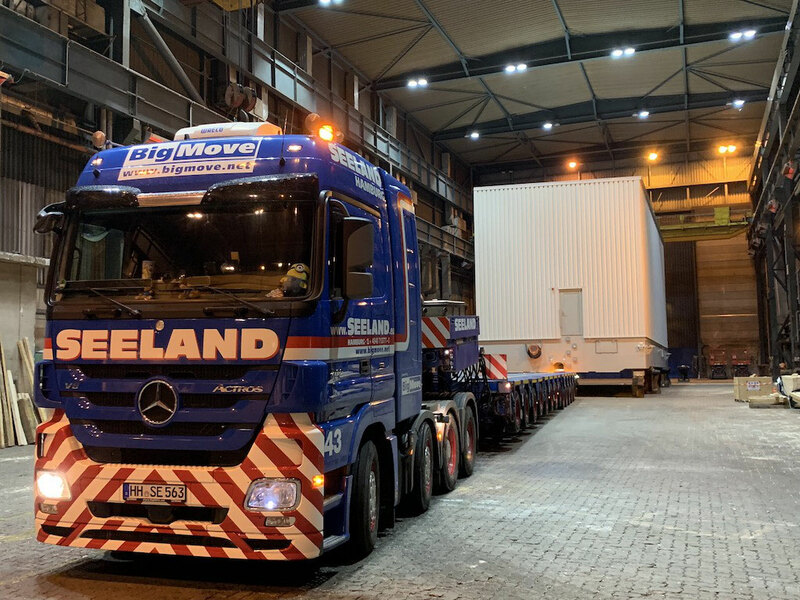 Together with our partner Gustav Seeland GmbH we transported the container from our hall up to our quayside. Stay tuned to see some pictures from loading onto pontoon. We’d like to thank all involved parties for the great job. As from June EPS can provide indoor space for assembly purpose. The space consists of two halls with a total space of approx. 5,500 square meter. 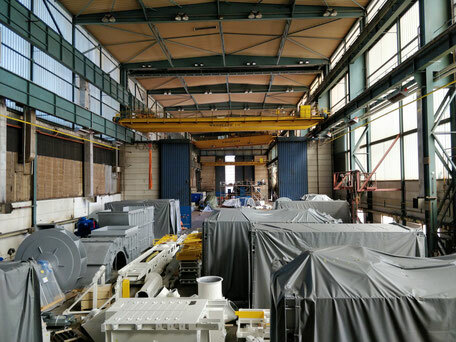 The halls have overhead cranes from 16 tons SWL up to 80 tons SWL. Additionally the halls can be heated in winter time. 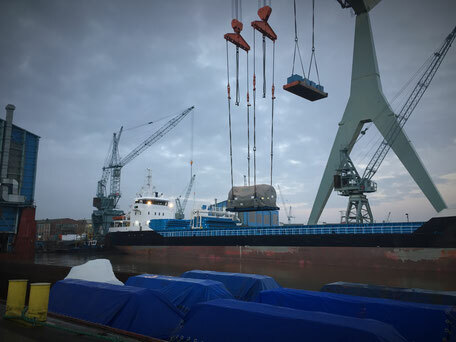 End of March we took delivery of the first of two bridge girders at our shipyard in Hamburg. This was part of the construction for a pedestrian bridge for the Hamburg light rail system planned for final assembly in our yard. This was accomplished indoors in our large machine shop buildings on our premises. With utilization of our overhead cranes, the final support structures as well as all glass panels were added and properly installed. 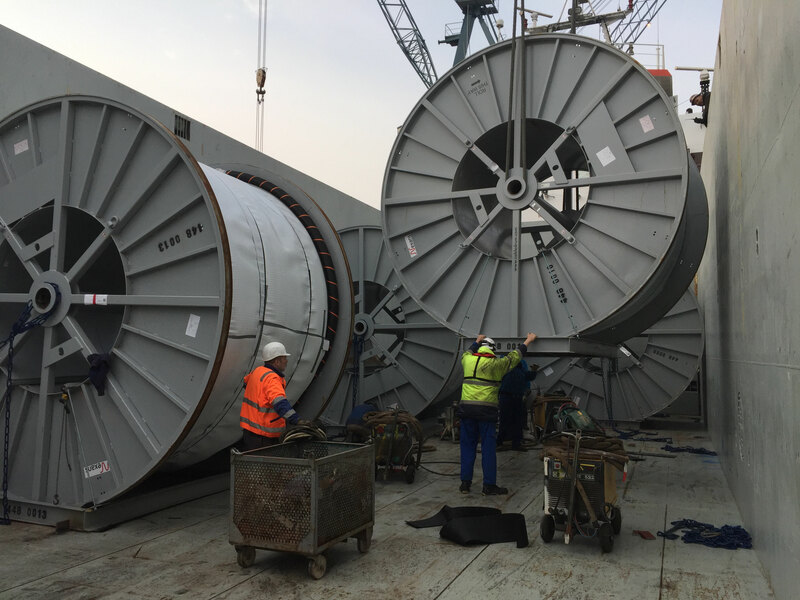 The respective sections were 39 and 20 meters long and had individual weights of 72 and 100 metric tons when they were transferred to under hook by our own SPMTs (Kamag). 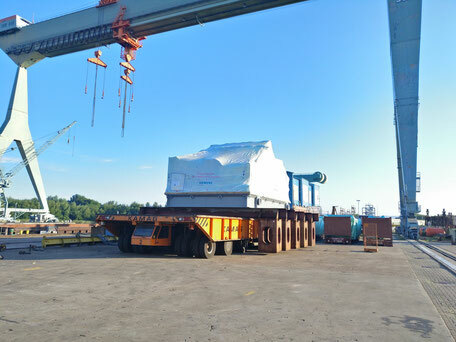 There, the fully assembled sections were transferred to deck barges with our very own Jucho cranes. 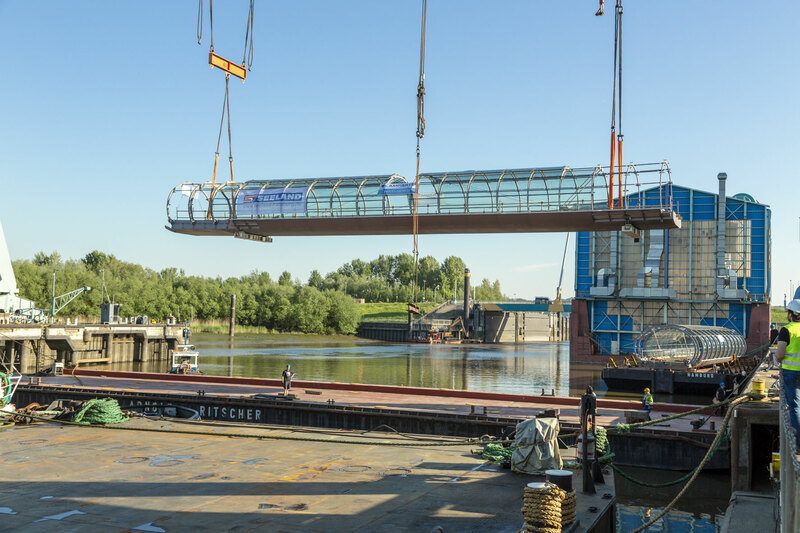 Upon arrival at their final destination they were unloaded at the ‘Elbbruecken’ (bridge crossings across the Elbe river) in Hamburg. The construction company Lamparter as contractor for the EPC Seeland early realized and appreciated the unique setup/service package offered by EPS for the successful execution of this assembly and transport job. We would like to express our gratitude to all parties involved for the excellent cooperation throughout. 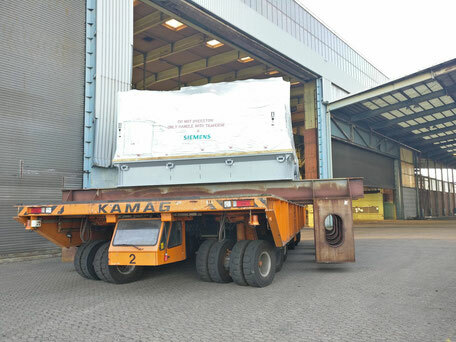 Lately we discharged one turbine with a unit weight of 250 tons and moved it with our SMPT into our warehouse. The turbine will rest there for several weeks in order to execute final assembly steps. Additionally we are supplying our customer with scaffold construction and other services. Afterwards the turbine will be loaded into a port barge for further transport. Thanks to all parties involved. 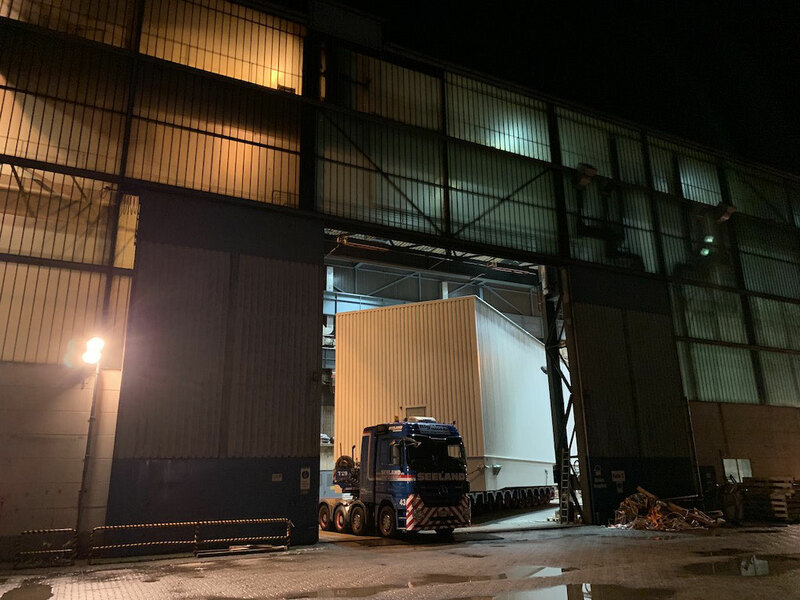 Recently finished loading of several turbines with unit weight up to 230 tons for client Rolf Riedl GmbH, Hagen. The units have been delivered by river barge, discharged on quay and re-loaded onto coaster including lashing, securing and welding. In April 2017 we finished another project. In this case 13 cable drums with a total weight of 560 metric tons have been delivered by truck. We stored them for several weeks until they’ve been loaded onto a coaster. 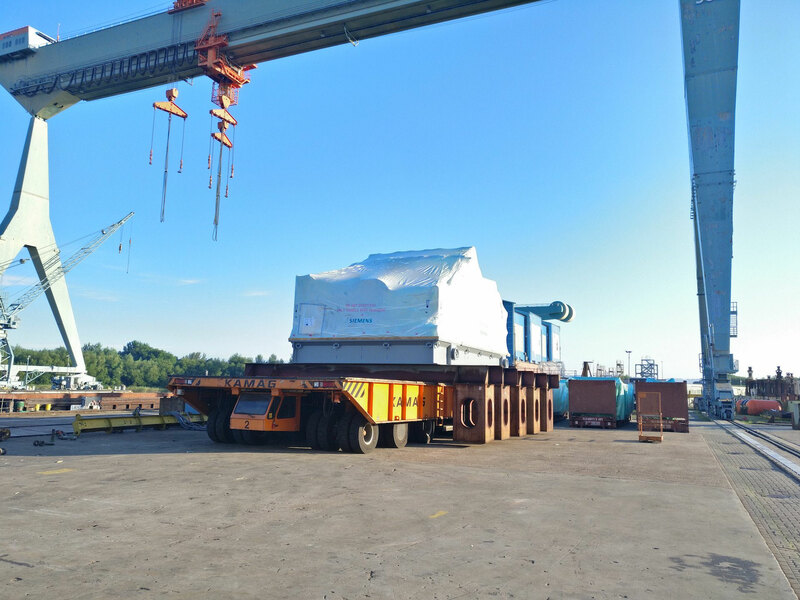 In Addition to the cargo handling EPS took care about the lashing, securing and dunnage. Thanks a lot to all involved parties. Since August 2016 our customer delivered abt. 62 standard trucks and 12 special trucks with machinery parts to our facility. We provided abt. 2,100 sqm of storage area until April 2017. After receiving the shipping specifications EPS did the sorting and marking of all packages. Following, we did the stuffing and securing of abt. 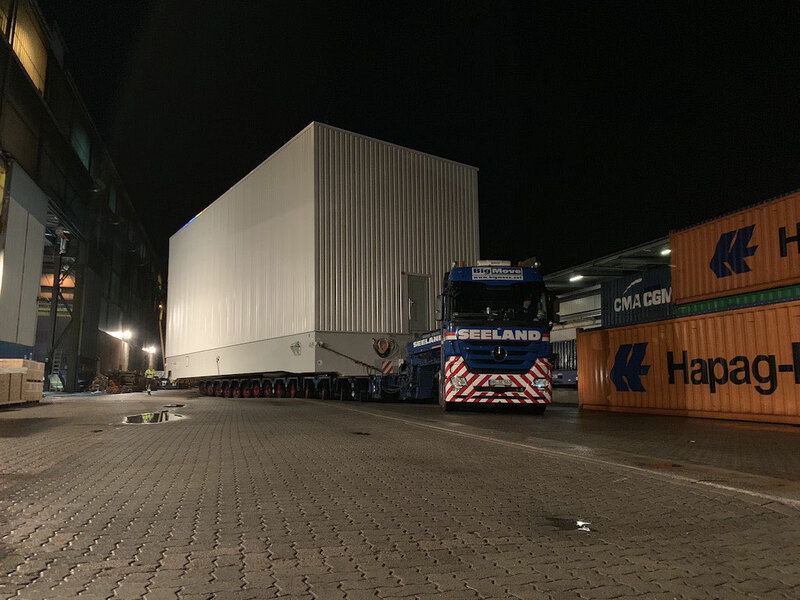 64 standard container and 14 flat racks within days. Lastly, we delivered the standard container by truck and the special equipment with port barge to the export terminal. We thank all involved parties and we are happy that the next project already started.